An article titled “Norway’s Child Welfare System takes over responsibility of the family” (“Barnevernet overtar familieansvar”), published two days ago in Norge Idag (a Christian newspaper published in Bergen), observes a harrowing picture unfolding for children and their parents in Norway. “A pilot project has been activated in three Norwegian municipalities: Tjøme, Alta and Røyken. 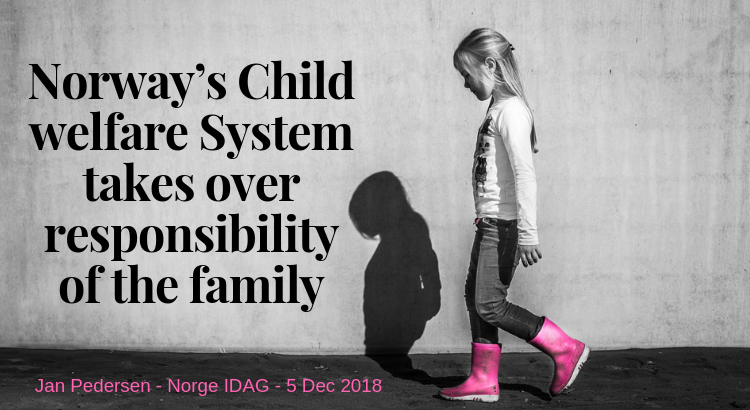 From 2017, and for three years to come, Nøtterøy / Tjøme Child Protection will have received 20 to 22 million NOK each year during the trial period. Take a look at the NRK-Vestfold website. To be visible and accessible, the child welfare services will now have permanent office hours once a week at the schools where children and young people are. The municipality’s child welfare services will be able to enter the school’s area of ​​authority. This is an attack on the basic Christian creational order: Parents have parental responsibility; the school is going to help the parents to whom all social systems are responsible. It is the family that decides! If this project is continued beyond the trial stage, it is realistic to think that this will become the current rules in all municipalities after 2019. Then, the child welfare service can take over family responsibilities, teachers‘ decisions, yes, the entire school authority that is delegated by the family. As a primary school student in 1940-45, I experienced the parents‘ resistance when the Nazi state would use culture and school for ideological indoctrination. The parents claimed to be bound by family and parent responsibility. It had great effect. The resistance against authorities’ forcefully implemented involvement in child raising, can be based on the Bible: Children, obey your parents in the Lord, for this is right! This is probably one of the verses in the scriptures the families are bound to when it comes to child raising. Here, public bodies must yield when they want to indoctrinate.